If you have been keeping up with the Horsepower Monster's 427 Small Block Buildup, we've wrapped up the final video in the series with a dyno session--you can find it above. But if you are new to the build, we recommend staring from the beginning--all the videos in the series are posted below. These days it's getting pretty hard to do anything new with the classic small block Chevrolet engine. Heck, even big inch strokers have been done before. But we promise, this is different. Before, getting over 400 inches into a small block meant weeks of tedious grinding and prefitting along with expensive custom components. The process was so time consuming and expensive it made building a Chevy bigger than the classic 383 inches more trouble than it was worth. But now, with intelligent component selection from the right manufacturers, you can build a 427 with all off-the-shelf components. And we're going to show you how. Not only is this engine package easy to build, but by using all readily available components it makes building this attention-grabbing stroker basically the same cost as a well appointed 350. The key is Dart's outstanding SHP Chevy block and a set of innovative connecting rods from Callies. A new SHP block is barely more expensive than a stock block pulled out of a junkyard and machined back to spec--plus it's capable of handling much more horsepower and can handle 3.750 inches of stroke and 4.125 inch cylinder bores without breaking a sweat. Normally, using a crank with more than 3.75 inches of stroke in a Chevy small block with a standard cam tunnel location will send the sides of the rods crashing into the cam lobes--and we all know that's not good. But the Ultra XD I-beam rods have the fasteners on the big end of the rod offset so that the side closest to the cam lobe is moved down, creating 0.050 of an inch of extra clearance. We also ordered up a reduced base circle cam from Comp Cams to be extra safe, but the Callies rod is enough to fit an impressive four inches of stroke without having to grind the rod caps. Our goal is to build an engine capable of 550 horsepower or more than will be happy on pump gas and can be driven every day. This is not a tempermental, high-compression race motor that's poorly suited for street use--this is a street motor that's should make great power, generate loads of torque and have a rumble that will turn heads. Plus, it should be strong enough to handle a strong dose of nitrous or whatever else we choose to throw at it in the future. The first video in the series (above) features the work required to balance the rotating assembly as well as clearance both the K1 Technologies crankshaft and the Dart SHP block. Thankfully, the clearancing work required is minimal and after this the engine should practically fall into place. This time around we're actually putting stuff together. In particular, rods, pistons and the crankshaft. 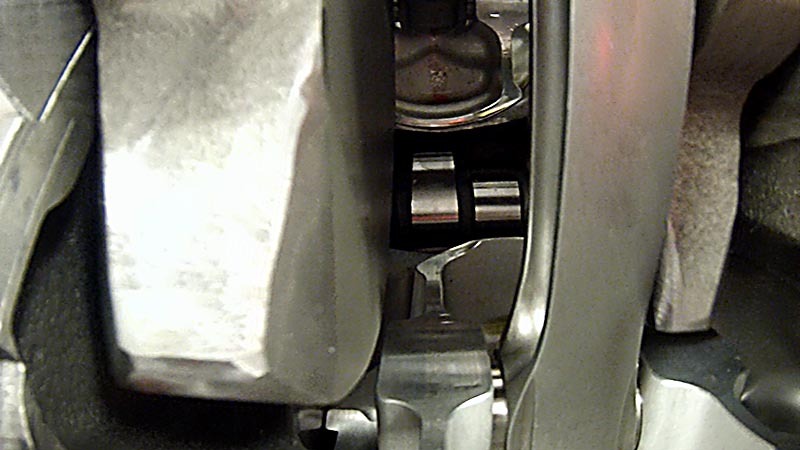 Plus, we take a look at a new system from a company called KRAMM-Lox that makes installing piston pin locks a snap--literally. We worked very closely with Comp Cams to choose the perfect cam for this build. Just like everyone, we want to make great power but don't want to give up any driveability. We also install the timing set, ATI damper and Edelbrock aluminum water pump. Finally, with Part Four we are starting to wrap things up. After much deliberation, we settled on a pair of Dragonslayer aluminum cylinder heads from Brodix, and now that we've seen them in person cannot wait to see how they perform on the dyno. We also wrapped up the valvetrain with a set of hydraulic roller lifters and a really trick Ultra Pro Magnum rocker arms--both from Comp Cams. For the ignition, we chose a comprehensive setup from Pertronix, which includes the distributor, coil, and plug wires. At first glance, the intake manifold may look a little odd. That's because we've already had the Weiand Sealth dual plane intake treated to a couple coats of clear coat. The idea is to seal off the aluminum so that dirt and grime won't grunge it up so quickly. Otherwise, the Weiand piece is as it came right out of the box. It is one of the most aggressive dual-plane intakes we could find and should do a good job of feeding all 427 cubic inches with all the air and fuel they can handle. Finally, topping everything off is one of Holley's new Ultra HP carbs with all the bells and whistles. And finally, if you want to try this build yourself, here's the printable parts list. Make sure to let us know what you think in the comments below. That's going to be a monster! Can't wait to see more. I need this in my Monte Carlo. Are you going to show it running? Well, I bought a low mileage LQ4 engine last year with plans to build it for my TransAm which was running great with a cam only LS1 at that time. I bracket raced the car about every other weekend with no problems. Then one day my wife decided to drive it down a flooded road She sucked water in the intake and bent a rod The good news was that I already had an engine to replace my hurt LS1 Even better news was that insurance gave me 5100 bucks for a replacement engine. I decided to build a forged 404 cubic inch stroker. Any way enough of the long story...... Here's the build info and some pictures. LQ4 Iron Block TFS 225cc heads prepped by TEA Custom Pat G cam Yella Terra Roller Rockers Comp Double Roller Timing set Melling oil pump Eagle crank Eagle rods wiseco -2cc pistons FAST 102/102 Texas Speed 1 7/8" headers Magnaflow 3" full exhaust TCI Super Street Fighter 3500 stall Performabuilt Level 2 4L60e walbro fuel pump 42lb ford svt injectors ARP head bolts ARP main studs I just put the heads on Monday of this week. Thanks to Hinson Super Cars and Texas Speed for supplying the parts. There are limitations to such a large displacement in a small-block, particularly due to the under-square bore/stroke ratio that complicates frictional losses. However, the total potential for this new engine platform hasn’t been fully explored yet. Gadette says the deck height could be trimmed down to 8.75 inches, giving engine builders for Bonneville-type vehicles or even Pro Mods the potential for an over-square bore/stroke ratio and much higher-revving capabilities — especially with boost. Good job not trusting the torque wrench and checking the stretch on the rod bolts. Now hurry up and give us the rest. Nice job I am a Lincoln tech student love cars hoping that un day. be a good technician. And build my own engine. Awesome project, but in the past I have seen 383's an 388's put out 650 HP on pump gas. If the 427 turns out the way I expect it to I will be all over it. Hey Rob. If love to here the particulars on your motor. I'm building a tube chassis 68 Chev truck for the street and just thinking what I'm going to use for an engine. That's very interesting, Bill W. The curb weight on a 1970 Nova two door is 2720 pounds. To run a 10.2 second quarter mile pass (as you say) at that weight would require 590 horsepower. Please tell us how you got such an amazing amount of horsepower from such a small engine? It's practically unheard of. Curious about carburetor choice. You're making over 500hp with 750cfm carburetor. Seems like bigger carburetor at least 850cfm may be appropriate. We went with the 750 cfm carb because we tried to emphasize that this is a real-world build that you can drive every day and not just an effort to hit some big horsepower number. We maybe could have gotten more power with a bigger carb, but the 750 will probably be the best choice when it comes to driveability on the street. Thanks. I am very excited that I came across this build. Getting ready to build this engine for my 55 Gasser. Can you please tell me what the compression came out to? What was the thought behind hydraulic roller vs mechanical roller? Thank you for your time! I’m sorry what carb did you guys go with the model of carb?? Whats total cost of project and why not fuel injected? 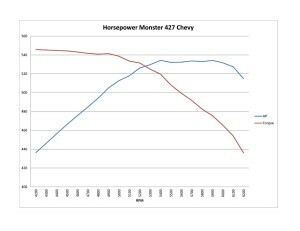 I would love to know if Procharger or supecharger would compliment the Monster 427 or hurt it. I'm all for carburetors, but these days would a fuel injection system help in the drivable aspect theory? Curious is why I ask. Sorry, forgot to ask final compression ratio, I'm so bummed out here in East Texas, since moving here I nearly tear up seeing my 1970 Wildcat sitting as I lay here day in day no No One.. I'm going to do a 427 build for my 72 blazer with a 4l60e trans, 3.73 gears, and 31" tires. I'm also running PB, PS, AC (will never really be turned on that much) Could I use the same cam specs or do you advise a different spec? I'm shooting for all TQ and want it to be linear across the rpm range. Hi, I have a few questions. I am currently in the process of building the 427 stroker small block chevy that you guys did in your videos. I have the DART SHP Block 31161211. I am doing this engine build over at a local hot rod shop in Torrance, CA. I also picked up the K1 Crank, Pistons and Connecting rods that were are the parts list for this build. However, the mechanic that is helping me mocked up this combination and it looks like the piston doesn't sit flush with the deck of the block. He is saying that it is way above what the tolerance should be. I was curious what the compression ratio was on the engine that you guys built? Also I would greatly appreciate any input from you guys. You can email me or call me on my cell 310-567-6601. My other questions was what the make and model number was for the Camshaft. I couldn't find part number 12-000-8 for comp cams. Thanks again for your time look forward to hearing back from you. It appears you may have the wrong rod length? sounds like you may have 6 inch rods?? As for the Cam # its Comp Cams custom grind which means you supply the spec you want it machined to. I am also looking for the cam specs used.here yet no one seems to know? and this group is not sharing the data. Not sure why not?? nice build but i bet I can build a better mill using a SB mopar. I want to order this cam but there is no specs for it?the cam # is for a blank core.